Craig Kennedy isn’t a democrat — he’s a South Dakota democrat. He made sure all the delegates sitting in the auditorium Wednesday morning walked away knowing the most important thing to him is that South Dakota comes before his party. Kennedy is a member of the Democratic Party and serves as a senator to the South Dakota Senate. He represents District 18 and was first elected in 2016. 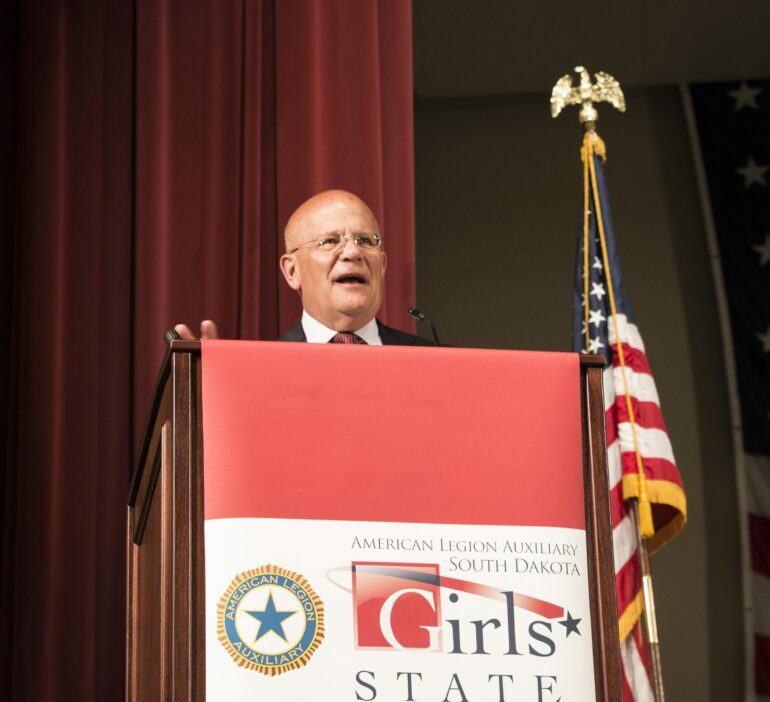 He, along with Republican Kristie Fiegen, came to speak to the American Legion Auxiliary South Dakota Girls State girls in Aalfs Auditorium Slagle Hall. “You’re actually no different than any of us,” Kennedy said, opening his speech by assuring delegates that they, too, had potential in the political arena. He pointed out that all of the speakers of the day — Thune, Fiegen and himself — were native-born South Dakotans and once filled with the same potential and ability. He then talked about a very important anniversary happening in South Dakota. “My grandmothers were young women when the right to vote was finally given (to women) in South Dakota,” Kennedy said, referencing the 100-year anniversary of women’s suffrage in South Dakota. However, considering the purpose of Girls State is to continue to empower women, Kennedy was quick to point out that it’s been all in a century’s work. “We’ve come a long way, but we’re not all the way where we need to get yet,” Kennedy said. It was clear Kennedy was passionate about his position of advocacy of the people in South Dakota. Much of his speech was dedicated to the importance of improving the quality of life, economic opportunity and equality in representation in the government. Not everybody took to Kennedy’s speech, though. The senator focused on topics like healthcare, education and bipartisanship in South Dakota. While some delegates agreed these topics are important and worthy of discussion, just as many said there was little reprieve from the seriousness of it all.